The Miss America contest has scrapped its swimsuit competition, striking at the most derided part of the contest. It is long overdue. Coming in the wake of the #MeToo movement that exposed sexual harassment — actually, sexual abuse — of women in many walks of life, this is a blow to the outdated, voyeuristic and prurient aspects of beauty contests. 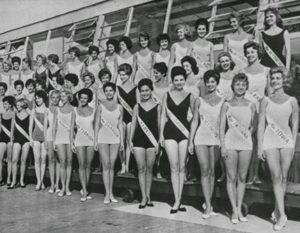 The Swim-Suit picture of Miss America 1962, staid by today’s standards. In recent years, viewership interest — and corporate sponsorship — in beauty pageants have been dwindling in industrialized societies in the backdrop of changing social mores and attitudes between men and women and in the way society judges women. At least in public discourse, men and women in the First World rejected the idea of subjecting women to this kind of objectified evaluation in terms of the size of their bust, waist and buttocks and how well they filled a bikini. The Feminist Movement and women with professional degrees joining the work force in large numbers in the last several decades have contributed to this transformation. By 2015, only bare essentials are covered with not much left to cover Swim Suit parade. in cosmetics and designer apparel, global companies now sponsor these events in Asia. Never mind that it goes against the prevailing culture of modest attire in these countries. With the Second and the Third World aping their Western counterparts in everything (see the swim suit photoshoot on the next page in the 2017 Miss India contest), here too, I am sure, they will ape the West by scrapping the bikini contest, going forward. That is why it is important that Women’s Movements retain the cultural values of their lands, even as they work towards bringing fundamental changes to reduce gender-based violence and domestic abuse. Indians are catching up with the West… … in this too. Miss Miss India Suit 2017. There is a visual image associated with social workers in India. They are called jholiwalas and Jholiwalis, because they always wear simple khadi clothes with a cloth bag slung over their shoulders. To convey their important message they always wear simple cotton dresses in local designs. This entry was posted on July 22, 2018, 6:20 pm and is filed under July 2018, Past issues. You can follow any responses to this entry through RSS 2.0. You can skip to the end and leave a response. Pinging is currently not allowed.